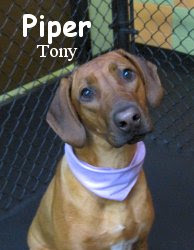 Checkout Piper... She is a nine month old, seventy-five pound, Rhodesian Ridgeback. Piper had an absolutely entertaining stay with us in our Big Roll. She fell into the doggie daycare groove instantly! It's obvious that Piper has been around a dog or two in her short life. Her play style is fast and furious, yet seemingly gentle at the same time. Piper was a joy to have here at Fort Fido. She is very sweet and we will welcome her with open arms upon her return. Well done! Ahh, so far we are 3-0 for assessments this week. We most certainly hope we stay the course. Tomorrow there are two lined up, our fingers are crossed lol. P.S. How could I forget, here is a clip of Piper and Ziva rippin' around. Too cool! Busy week ends with Gregarious Gracie! Looking for cool dog stories? 550 Survivor Art Collars & Leads are here!